Tasks for Builds and Releases related to Governance Topics. This extension includes a group of tasks that can deploy Azure Policies and Initiatives. Note: This project is used with GitHub and Azure DevOps projects features. Where GitHub is used for code and issues, but the complete build pipeline is hosted on Azure DevOps in the background. This task is intended to make it easier for you to publish Azure Policies and Policy Sets (Initiatives) to your azure tenant. This tasks needs a Azure Resource Manager service connection with a properly configured service principal. You can go forward and use Azure DevOps to create a service connection, by choosing any subscription. In the customizable configuration (image below) you choose the scope level "ManagementGroup". Then you should choose a proper connection name and a management group. Since the chosen management group only defines the permission of the service principal and not the scope of anything you deploy you should set it to the highest group where you want to be able to deploy everything to (for me mostly the root tenant group). Alternatively, you can go the more manual way and create an AAD application with Service Principal yourself and add the information into the advanced service connection form. Either way, the service principal must be added to highest group where you want to be able to deploy. Additionally, you can only use the roles "Owner" or "Resource Policy Contributor" (the latter is recommended, but in preview). These roles are the only one that have write permissions for policies. With these settings in place, they can deploy to any management group or subscription scope that has been defined in the task. Choose if you either want to deploy a policy or a policy set. Choose a connection that creates a service principal which is assigned to a management group, which has the proper permission as explained earlier above. For how to do it, check explanation above! Choose the scope of the policy, which can be either scoped to a management group id or a subscription id. Choose if you want to deploy with one JSON file or if you want to have a so called "splitted deployment", which gives you more control on release time, what kind of values you want to choose. Choose if you want to provide a file or if you want to use online JSON for the deployment. Choose if you policy should be in "indexed" or "all" mode. Where indexed only is valid for resources, that support location and tags. Unique name to identify this rule / set. This must be unique in the whole tenant. Choose a display name for the rule / set. Choose the category where the rule / set will be deployed to. Choose the file which holds only the array of parameters. The file which includes the rule or rule definitions, depending if you are deploying a policy or policy set. This includes a more detailed description of the policy or policy set. 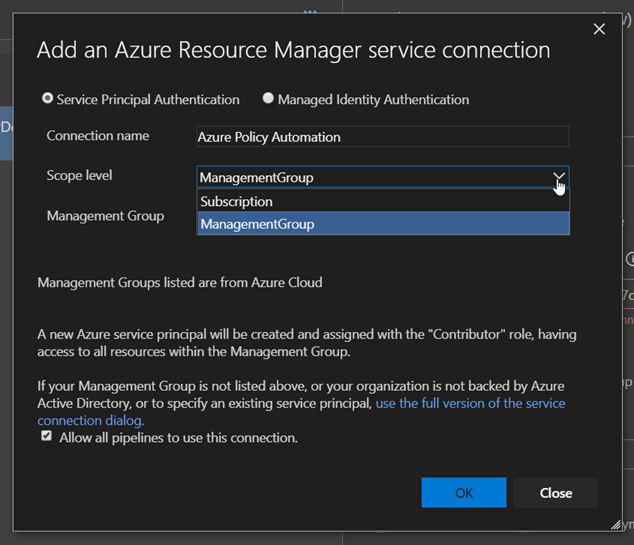 Changed the Azure connection to only use scope levels of "ManagementGroup". Note This changes how the connection you created changes its behaviour. Before this connection of the scope level "Subscriptions" where accepted. Now only connection for "ManagementGroup" scope levels are used. This will cause your previous connection not being shown anymore. Even though, this change can break your pipeline only a minor version is changed. This is due to its previous status.